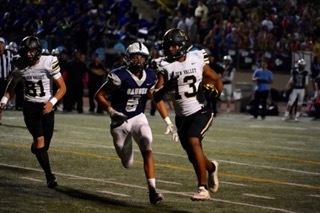 Johnathan Kaelin, Golden Valley’s captain, receiver and safety has led the Grizzlies with a remarkable performance during the 2018 season. Leading the team in several offensive categories, Kaelin is a strong player on the field as well as being a team leader. Kaelin has had a very good season so far and credits his attitude for that success. “I have faced no obstacles because I don’t let anything tear or bring me down. I just keep pushing and working hard,” he said. Every successful quarterback has a go-to receiver and for Grizzly signal caller Zack Chevalier, it’s no different. Kaelin has many skills on the field, leading the team with 8 total touchdowns (4 receiving and 4 rushing). Kaelin told us his strengths on the field were scoring, getting yards, and big hits, and he is not afraid to show us that during the games. Even though Jonathan performs exceptionally there is always room for improvement. Head Coach Dan Kelly shared how important Kaelin is to the team and what he brings to the team. “Jonathan is very important to the team. He plays a lot of key roles on offense, defense, and special teams. He’s a play maker. He is not a real vocal leader but he leads by example with the way he plays in the game. He is young and is at his peak like a lot of our players,” Kelly said. Like many high school athletes, Kaelin has both short term and long term goals. He told us that his goals for right now are to lead the league in tackles and help his team win as many games as possible. Long term, like many others, he hopes to play in the NFL. Watch for this up and coming junior to have a big senior season as he leads the Grizzlies.